As any parent, youth educator, or frequent babysitter knows, children aren’t merely “small adults”: they have a different set of perspectives, logic, and attitudes that drive how they perceive and interact with the world around them. So, if you’re designing a product that’s going to be used by children, how do you make sure that you’re creating something that will be valuable and engaging for them? As with any project: start with user research. In fact, user research may be doubly important when it comes to creating products for kids. Children have different expectations for their products’ visual appearance, and interactions that seem commonplace to adults can prove challenging for kids. For example, while a hallway test might suffice as a quick gut-check when designing for typical adult audiences, when it comes to designing for children, it’s extra important to conduct user research with participants that match the age and abilities of your intended audience. At Myplanet, we conduct extensive user research with special audiences all the time, but kids have always posed an interesting challenge. We’re going to walk through some pointers for how to get started with planning and preparing for research, how to frame sessions so kids understand the tasks and are comfortable giving you feedback, and how to behave during testing so that you get the useful and actionable insights you need. The first choice you’ll have to make is whether you want to test in person or remotely. Remote participants can be faster and easier to recruit, assuming your demographic is relatively tech-savvy; additionally, it allows you to reach participants from a wider geographical and/or socio-economic demographic. With that being said, you’re likely to get richer data when doing in-person research. It’s easier to keep users engaged and focused, and you can see their facial expressions, body language, and behavioral nuances when they’re using your product. This can be important when you’re working with users who have trouble verbalizing their thoughts, for whatever reason. It’s also important to note that in-person testing lets you see the true context of use for your product. Are they in the basement playroom where wifi is sketchy? Is a sibling distracting them while they’re trying to complete a level? Does the old family iPad need to stay plugged in due to a dead battery? These kinds of observations can have real and important consequences for how you design your product. When conducting research with children under the age of 10, it’s best to stick to in-person testing. Remote testing with younger children tends to make things trickier as it’s harder to bring them back on track if they get bored or distracted. Testing tweens and teens remotely can be quite successful, however. Both remote and in-person testing have their pros and cons, but best to stick with in-person testing for kids younger than 10. The next step is finding participants. If you’re not working with a user base you have access to, there are plenty of other ways you can recruit. To start, reach out to your social networks or leverage online forums that list market research opportunities. Don’t be embarrassed to call on friends to help as well; ask them to share posts in family-centric social media groups or hand out flyers to parents in their kids’ soccer, choir, or theatre groups. You can also try posting flyers at places where young families frequent such as libraries or community centers. Contact daycares, preschools, or day camps to see if they would be willing to pass your information on to parents. Try starting with those around universities and colleges, as they may already have experience with academic researchers doing similar things. You might even find an organization that’s willing to have you conduct your sessions on site, which can allow you to quickly test several kids in one day. Whichever methods you use to recruit, be sure to provide a brief description of your research goals: what is expected of the participants, the location and duration of the sessions, and the incentive for participation (i.e., gift certificates or cash). If you’re recruiting for specialized populations (e.g., kids who are bilingual for specific languages) increasing your incentive may help you recruit. Now that you’ve got participants signing up, you need to figure out what to ask them. The questions you use will vary project to project of course, but in general, it’s best to stick to concrete questions for younger children. For instance, asking “What’s the best thing about being a kid?” as an opener is too esoteric for a 6-year-old. Questions like “What’s your favorite game?” or “What’s your favorite subject in school?” are easier for them to grapple with and produce more open and enthusiastic responses. As a bonus, their examples may offer design inspiration for how you want your product to look and feel. It’s important to pilot test your interview script. Recruit extra participants or a kid that’s not quite in your target demographic to be a guinea pig in a trial run of your session; in a pinch, you could even ask a coworker who’s got lots of experience with kids to role-play as a child. Pilot testing helps identify problematic questions and highlights instances where terminology is too complex or jargon-y. It also gives you the chance to try out how to best position the researcher, the participant, teammates that are helping with note taking, and the recording equipment. Pilot testing gives you a chance to iterate so that your first “real” session with a participant goes smoothly. In a pinch, you can ask your colleagues to role-play as a child, and use them as your guinea pig when pilot testing your interview script. Framing the research activity clearly for kids helps them feel at ease and can help you get better insights. Let them know what’s going to happen inside the session: what kinds of things you’ll show them, what kinds of questions you’ll ask, and why you’re asking them. Kids can be susceptible to social desirability effects (i.e., the desire to say what they think is a good or socially acceptable answer, instead of what they really think), and this is especially true if there are authority figures present. Try to build a safe space where kids can feel free to be open with you. If you’re going to discuss any potentially sensitive topics, or even if you just want to learn what they don’t like about a certain experience, it’s important to let them know that no one will get in trouble or have their feelings hurt based on what they say. Be sure to also let them know that it’s okay if they don’t know how to do something or if they get confused, and that they can just tell you so. Just as when testing with adults, you want to clearly convey that it’s the designs — and not the kids — that are being tested. Building rapport is always important, but younger kids, in particular, may need extra time to warm up to you. Having a parent present can be helpful, and so can a fun warm-up activity. For warm-up games, offering a more energetic option along with a quieter one can help account for different tastes and environments. One game that works well is a freeze dance game — cue up your Spotify or have some kid-friendly pop songs downloaded and ready to go (tip: 8 year olds love Katy Perry! ), then dance until the music is paused. Fun, easy-to-understand games like this can be helpful in making everyone feel more comfortable. If there is a parent present, let them know ahead of time that they should be silent observers and avoid swaying their child’s responses or behaviors. If a child looks to their parent repeatedly for guidance, it’s fine to let the parent help out — so long as the parent isn’t driving the responses before the child has had a chance to reply. Saving a few minutes at the end to ask parents for their feedback can help them feel included as well. For more discovery or exploratory questions around preferences, you may not be able to rely on your usual formats. Asking an adult to rate the difficulty of something on a scale of 1 to 5 is pretty straight forward, but younger kids might have trouble conceptualizing this. Instead, try using a pictorial scale. 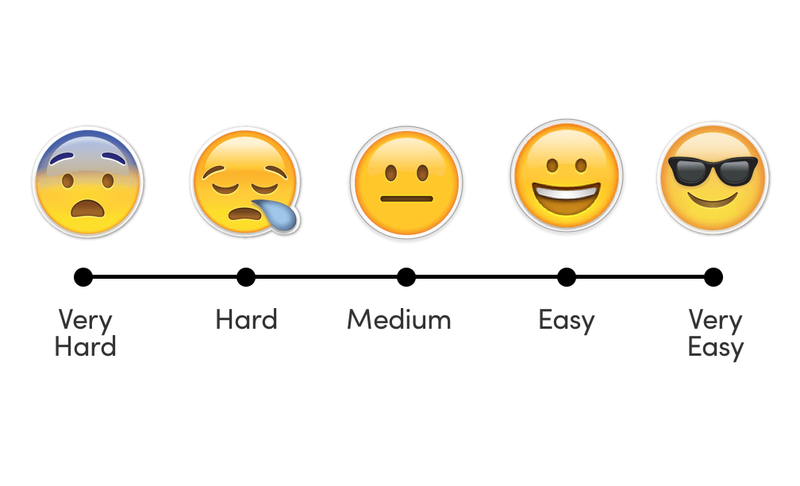 Place emojis or pictures along the scale to illustrate the relevant options, and ask kids to point to the emoji or image that matches how they feel. Depending on what you’re trying to find out, you can make different scales to capture how much they like something, how fun or boring they find an activity, or how funny they find your product illustrations to be. Since kids tend to be more literal than adults, it’s helpful to show them examples of what the placeholder content looks like prior to starting your usability test. Explaining that these images and funny-looking words are only there because you don’t have the real pictures and words picked out yet helps avoid kids getting derailed by filler content. Show your users an example of filler content and describe why you use it. Kids are also more likely than adults to try things out and click around to explore, which may take you down a testing path you didn’t anticipate. Be sure to prepare quick ways to reset the prototype or bring it back to key screens. Make your prototypes as realistic as you can, and link up as many states and screens as is feasible. And remember that seeing realistic icons and imagery will be important for kids who are still learning to read, as they’ll be relying on visual cues to navigate through your product. Ultimately, when conducting research with kids, it’s important to expect the unexpected. If a child is truly lost and can’t complete a task, try exploring it together by prompting them to try clicking something (“Let’s try it together, what do you want to try clicking?”) and asking for their resulting impressions (“Now what do you think this does?”). Don’t forget to give some positive feedback along the way! You don’t have to tell a child that they did something right or wrong (and in fact, this would be inadvisable), but saying “Great, thanks for telling me that!” can help allay any worries that they’re not doing the right thing. Stick with casual attire. Wear comfortable clothes that allow you to sit on the floor, and that can withstand spills, pet hair, or minor accidents. Not looking like a stern authority figure helps kids feel more open with you, too. If you have allergies to pets, check with the parents in advance and take the necessary precautions. 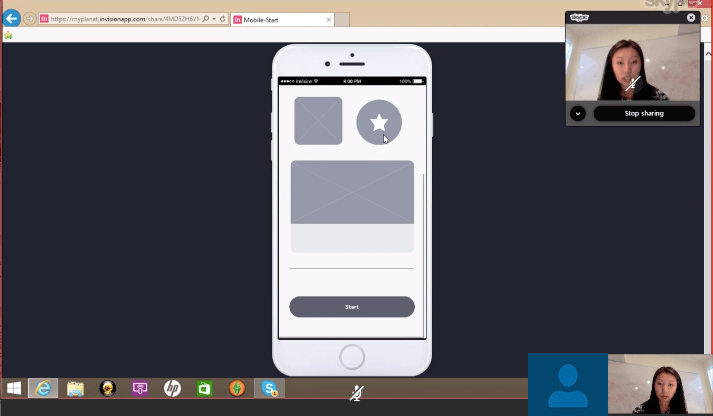 Download all of your prototypes and testing materials so you have offline access. Wifi networks might not be reliable, and you don’t want to waste time trying to gain access. Thank your young users by offering them a choice of a small reward for their participation (beyond any incentive you’re providing to the parent). Avoid food or drink, but stickers or age-appropriate toys are a good idea — though for the sake of their parents, please choose battery-free, mess-free, and relatively quiet rewards. An important goal for any researcher should be to make sure that participants come out of a research session feeling good. If a kid is getting bored or frustrated or tired, it’s ok to stop early. Be flexible during user research sessions, especially when kids or other special populations are involved. Ultimately, our job as researchers and designers is to treat our users well, and that extends into the testing sessions. One of the best parts about doing this kind of research is seeing kids’ unbridled enthusiasm for things. It’s inspiring to hear them talk about being motivated to learn or see the joy and wonder they have when interacting with the products they love. As a bonus, kids sometimes give really exuberant responses that are hilarious and provide great sound bites to show to your clients or teammates. So open yourself up to being inspired by the kids that you test, and carry over their excitement and passion into your own work! This article appeared originally on InVision.com’s blog. For more information on our user research practices and open roles, connect with our team here.